U.S. shipments of residential gas storage water heaters for December 2017 increased 0.2 percent, to 387,947 units, up from 387,063 units shipped in December 2016. 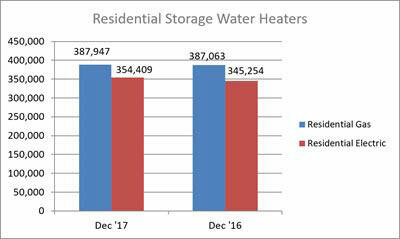 Residential electric storage water heater shipments increased 2.7 percent in December 2017, to 354,409 units, up from 345,254 units shipped in December 2016. Year-to-date U.S. shipments of residential gas storage water heaters increased 3.6 percent, to 4,359,297, compared to 4,208,984 shipped during that same period in 2016. Residential electric storage water heater shipments increased 4.8 percent year-to-date, to 4,127,302 units, compared to 3,937,936 shipped during the same period in 2016. Commercial gas storage water heater shipments increased 13.8 percent in December 2017, to 8,556 units, up from 7,519 units shipped in December 2016. 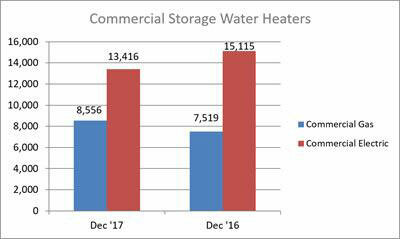 Commercial electric storage water heater shipments decreased 11.2 percent in December 2017, to 13,416 units, down from 15,115 units shipped in December 2016. Year-to-date U.S. shipments of commercial gas storage water heaters decreased 3.5 percent, to 93,677 units, compared with 97,026 units shipped during the same period in 2016. Year-todate commercial electric storage water heater shipments increased 19.6 percent, to 152,330 units, up from 127,344 units shipped during the same period in 2016. 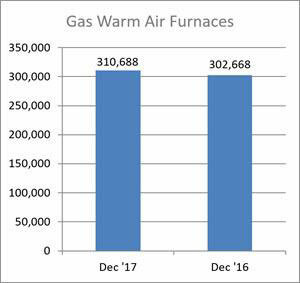 U.S. shipments of gas warm air furnaces for December 2017 increased 2.6 percent, to 310,688 units, up from 302,668 units shipped in December 2016. 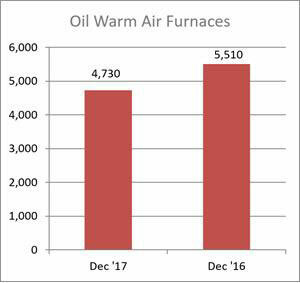 Oil warm air furnace shipments decreased 14.2 percent, to 4,730 units in December 2017, down from 5,510 units shipped in December 2016. Year-to-date U.S. shipments of gas warm air furnaces increased 6.5 percent, to 3,133,768 units, compared with 2,942,545 units shipped during the same period in 2016. Year-to-date U.S. shipments of oil warm air furnaces decreased 1.3 percent, to 37,268 units, compared with 37,743 units shipped during the same period in 2016. 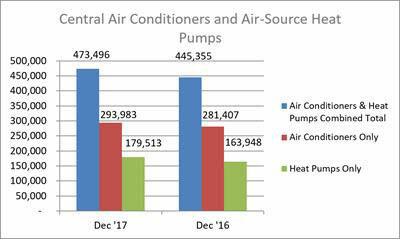 U.S. shipments of central air conditioners and air-source heat pumps totaled 473,496 units in December 2017, up 6.3 percent from 445,355 units shipped in December 2016. U.S. shipments of air conditioners increased 4.5 percent, to 293,983 units, up from 281,407 units shipped in December 2016. U.S. shipments of air-source heat pumps increased 9.5 percent, to 179,513 units, up from 163,948 units shipped in December 2016. Year-to-date combined shipments of central air conditioners and air-source heat pumps increased 6.5 percent, to 7,805,529, up from 7,330,859 units shipped in December 2016. Yearto-date shipments of central air conditioners increased 5.8 percent, to 5,185,747 units, up from 4,900,992 units shipped during the same period in 2016. The year-to-date total for heat pump shipments increased 7.8 percent, to 2,619,782, up from 2,429,867 units shipped during the same period in 2016.